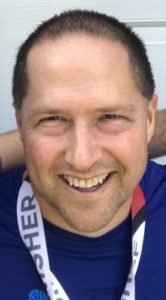 For those who didn’t know Gremlin, he was an F3 Mint Hill Pax member who passed away after a running workout in Jan. 2018 due to a heart attack. He is survived by his wife, Tonya, and three beautiful daughters: Sophia, Gabrielle and Alina. Rick was a UNCC alumni and member of the Kappa Sigma fraternity, hence the workout was held on the campus of the University of North Carolina at Charlotte. 0620 – Pax Departed with Shovel flags to Quadrant 1 – Alumni Pavilion. 1. Payton Stull (Kappa Sig), Gentle Grizzly, Tootsie & Runway (FIA) – for donating their Trucks and providing water support throughout the event. 8. Robins Nest, HighChair, Practice, Photon, Mrs. Othello – for helping out with set-up, the registration table, meal prep. etc, etc, etc. 11. Steel Cannon – whose extra coolers and buckets saved the day! 12. UNCC – for allowing us the use of the Campus for this legendary event! 13. Everyone else who I may have forgotten or overlooked (not intentionally) who helped, set-up, plan, organize, participate, breakdown and clean-up that day. You are ALL F3 MECA #HIM’s! 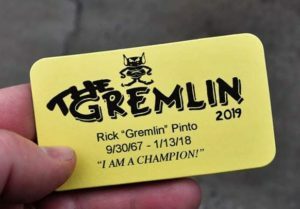 It was an honor to be part of this, I know Gremlin would be proud. Next time you find a “heads-up” penny, know that he is looking out for you! Aye! I commend you Othello for the level of organization that you showed throughout the entire planning for this event. This event went about as smooth as it possibly could have. For a first year event I expected some bumps in the road but there were ZERO!!! It was so great to see guys that didn’t know each other to encourage guys throughout the whole time. This was awesome and I can’t wait til next year.